Again, testing folks, please ignore this link and enjoy the post. No, not scraping my friends. There is a legitimate way to get some great market information from Facebook and I'm going to show you how. It all starts with the nifty invention of Facebook Ads, which was designed to help businesses target their audience based on demographics and other factors. It attracted Facebook spammers, local businesses and a few clever marketing firms, but as I've found there are many uses to this feature. What I wanted to answer: Which brand of boots would be more likely to return my investment on advertising online in Singapore? Create a sample advert by simply typing in any URL and continue into the next page. 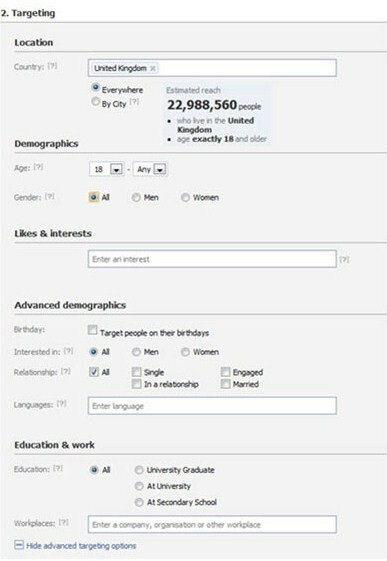 There is no fee required to access the following Facebook statistics. It's as easy as typing in ex. "United Kingdom" and you will notice an estimated reach statistic according to what you've selected. 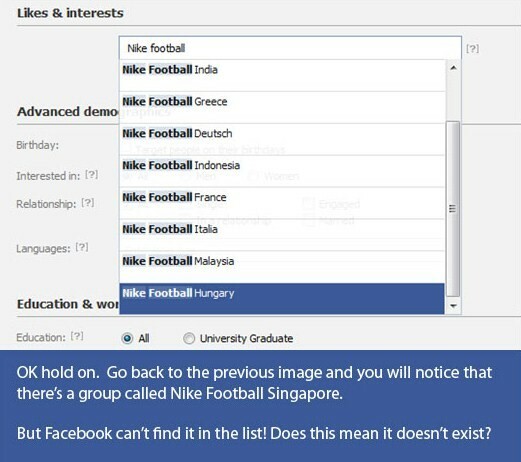 The results for specific search criteria such as likes & interests: "Nike" are entirely dependent on how many people have selected "Nike" as an interest. The main problem with the ad creation page is limitation. 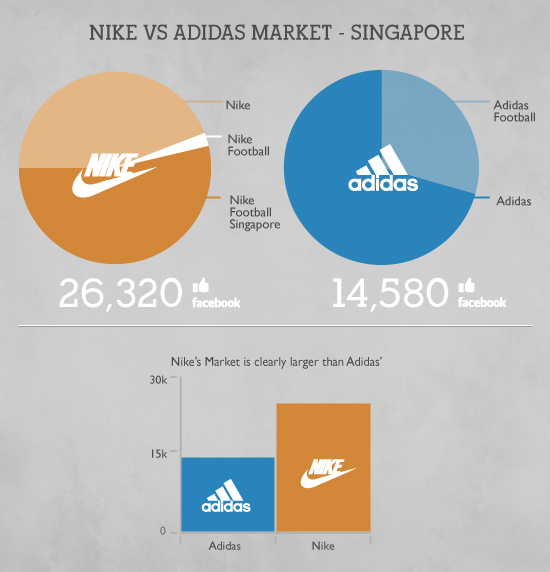 For the next few examples I'm looking to find everything relative to Nike, Nike Football, Nike Football Singapore and Nike Singapore. 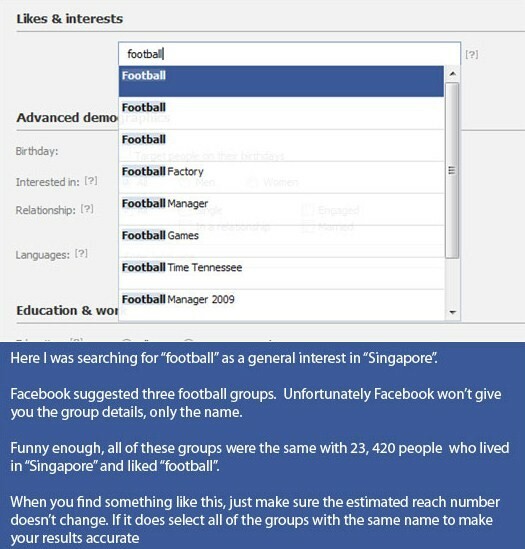 Using the search box in my personal Facebook profile I can start my research. 1. When comparing different likes & interests there is currently no way to remove duplicates. Ex. 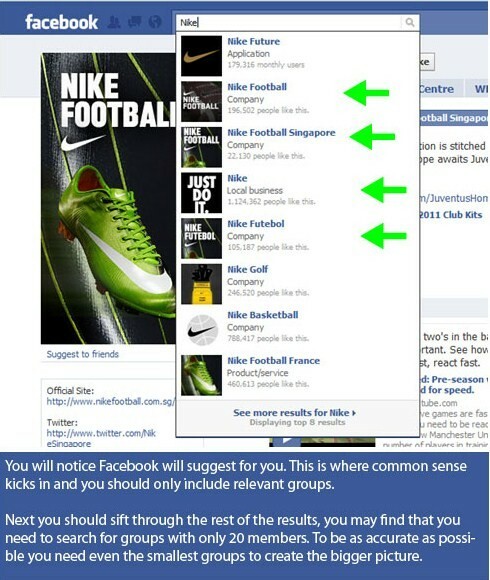 One person (or profile) can be fan of both “Nike” and “Nike football”. You might be tempted to scrape Facebook, and sort the data in a spreadsheet. I don’t suggest it, and it might be worth taking the time to read about lawsuits concerning this matter. 3. 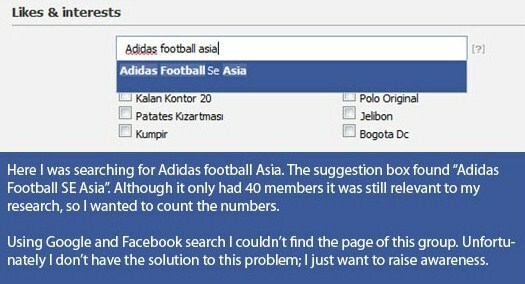 The search can seize and display previous results. This is a software error, if you notice that the same search suggestions keep appearing you need to refresh the page and start over. Using this method as your only source for your market validation would be a grave mistake, instead use it as an add on to your other primary and secondary sources. When it comes to finding legitimate information through Facebook, this is by far the easiest method, provided that your results aren't just a bunch of fake profiles. Yes, fake profiles. There's alot of them and of course these people will randomly join groups to maintain their status as a real person. So what's the answer? Make sure you use a sample size of at least 10,000, 100,000 is even better. On a personal note, try not to use this tool with an evil marketing grin. Facebook has been inundated with redundant, devious and deceptive advertising that has put even the most novice of users out of the "CLICK HERE TO GET YOUR FREE CREDIT SCORE" game. Be sure to read Sam's post on behavioral re-targeting. Here's an excerpt:"If you want me to buy your product, do something good, make a better product, hell make a better advertisement. Convince me your shoes can make me walk on water, make me laugh, draw pretty pictures, find someone that I trust to endorse your product. But, please, don’t trick me and stop following me around for Pete’s sake.